Ivana Thinks Pink: I framed my nails with a sparkly glitter! I started with a coat of Wet n Wild - Black Créme, best black polish ever. :) I didn't have patience to frame my nails with silver first so I decided to just place hexagonal silver holographic glitter around... I got glitter sample from Viva La Nails ages ago and I can't find them on their web page, but here you can see the glitters they have available at the moment. I'm not sure if they're thin like these I have but some colors really caught my attention. I prefer glitter over rhinestones, because they're thinner and the surface of a nail isn't bumpy as it would be with rhinestones. ps : you definitely rock short nails! and your cute little nails!! :) tell Carmelo i said heeello! I wanna try that with black borders and pink inside! Love it! I want to try it myself but I'm afraid I'll make a mess of it. WOW love it.... I'm doing this ASAP! ooooh, black AND shiny! So pretty!! Beautiful!!! I seriously doubt if I have the patience to pull this off! This is the most unique simple manicure I have seen! I defiently going to try it too! 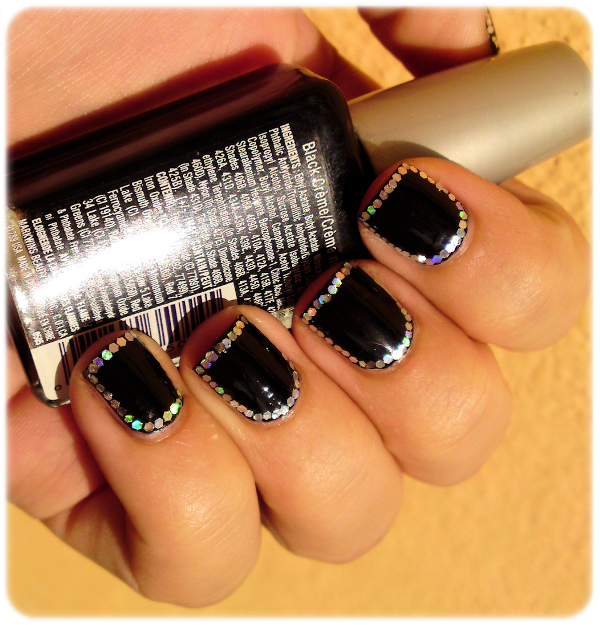 i have this polish and love it too, great for the price....love the nail look!! That's my favorite black for sure. :) Thanks! Ooooh I :L this Ivana!! Babe I LOVE this! You did a really good job! I am so loving this trend! I need to do this for myself! Thanks Fingers! :) I can't wait to see your try! 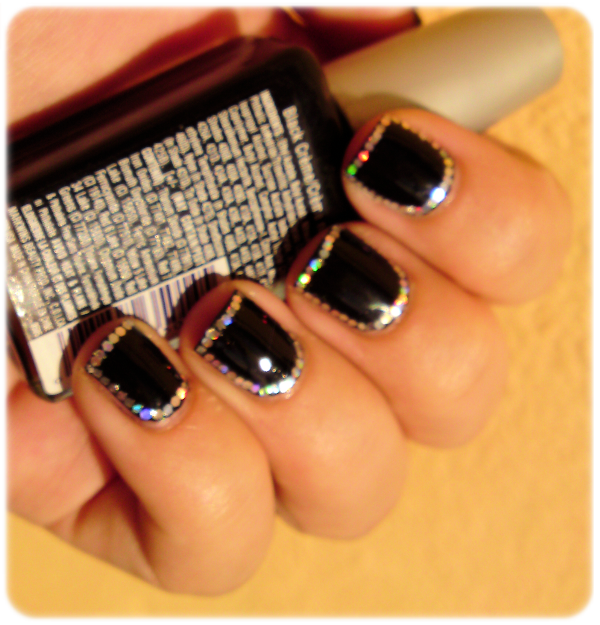 I'm in love with this mani, like seriously ! SO pretty ! What a lovely manicure! I really like it! Holy bananas!!! This looks amazing! 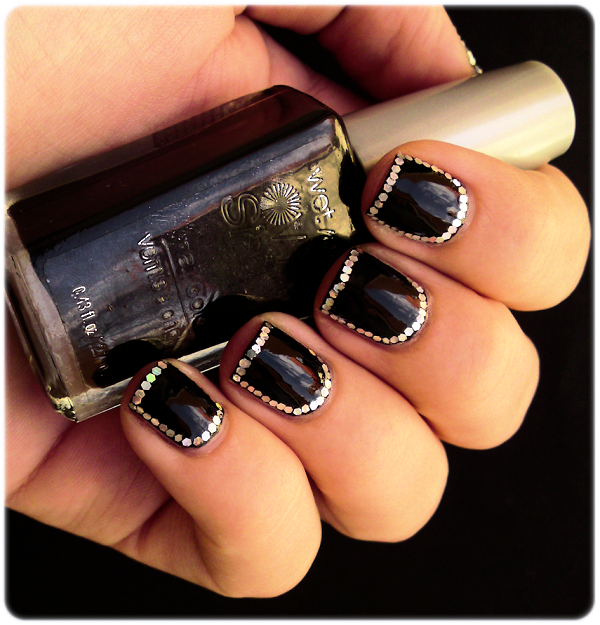 I definitely won't have the patience to do this mani!